The last post I made last year was the Common Segment Theorem. In this post, I am going to discuss the converse of this theorem. The proof of these two theorems are very similar. If then, . The following is its converse and the proof. If two collinear segments adjacent to a common segment is congruent, then, the overlapping segments formed are congruent. Based on the figure above, the theorem states that if , then . AB = CD by the Definition of Congruence. That is, if two segments are congruent, then their lengths are equal. AC = AB + BC (1) by the Segment Addition Postulate. 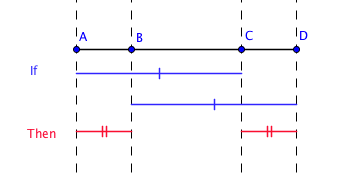 If B is between A and C, then AC = AB + AC. BD = BC + CD,(2) again, by the Segment Addition Postulate. Notice that both the right hand side of the equation in (1) and * are both BC + CD. Therefore, by substitution and transitive property of equality, AC = BD.
. This is what we want to prove.